This is another new CUTE image from Karen Lockhart's new release. It's called Tissue Box and it's a gonna be a must have stamp for Get Well Cards or maybe someone who needs a shoulder to cry on. You can find it in the Stamp Section at Ellen's online store or go to the NEW section and it's located there too. The outside looks pretty much like your basic Get Well Card except that I made the top wider. I simply scored 1/4" on each side of the half way fold which is 5-1/2". 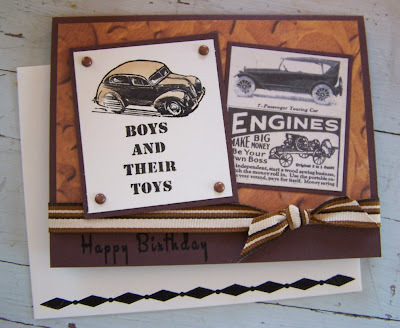 The card front uses Cosmo Cricket Sugar patterned paper, Memory Box and SU! Groovy Guava, along with SU! Groovy Guava ribbon. The main image is colored with Copic markers and this is double matted with a Spellbinder's plain circle die then a scallop circle die. I mounted that to the card front with SU! dimensionals. I wanted this to be more than just a card so added some cold season essentials to the inside of the card. There's a little tissue packet and a couple of cough drops. They are held in place with small sticky dots. This little dimensional card will not fit into a standard envelope but I would most like give these to teachers and friends that are a little under the weather. You could certainly mail it in a larger type envelope though. What do you guys for your friends under the weather....take chicken noodle soup, send a card, take over a dinner.......or stay as far away as you can? LOL! Don't forget to place your orders today at Ellen's store for 15% off! All you have to do is enter the word CELEBRATE when you are ready to check out. And don't miss my other post earlier today....just scroll down a little. Inchies and New Lockhart Images! Are you ready for some fun today? Today we're celebrating Ellen Hutson's 1 Year Anniversary of her online store! Congratulations Ellen!! Be sure to check out the STORE and her BLOG for all the fun happenings. While at the store, be sure to clink on the NEW link, this will take you to the new product additions, including brand new Karen Lockhart images. There are some cute, cute new images out, Karen you did a great job!! And also don't forget to add the key word CELEBRATE at the end of your order to receive 15% off your entire order. Woohoo, gotta love a sale!! And congratulations to Cindy Lyles and Sharon Harnist...they are the two newest design associates to join Ellen and Karen's adventure!! On with today's fun projects, I have lots to show you! The first photo below show what *inchies* are. These three inchies were created from one stamped image that I colored with Copic markers. Each separate image measures 1" x 1" and is adhered to chipboard squares. So the finished card has lots of dimension to it. Here's the finished card using inchies. The stamp on the top is a new Lockhart image called Clothesline. Look for it in the NEW section of Ellen's online store. The bottom image is also a new Lockhart image called Bib and coordinates perfectly with the Clothesline image. I stamped the word *baby* from the Baby Cakes Lockhart stamp onto the bib. Patterned paper is from the Cosmo Cricket Sugar line. Solid card stock colors are from Memory Box. Top scallop portion is cut from a scallop cut and embossed Spellbinder's large rectangle. And check out the green ribbon....it doesn't match one single color on this card! So why did I use it? I love to just throw in a random color sometimes to liven things up. I love how it just sets this card off! This next card below is another new Lockhart image called Best Cupcake. I think it's simply adorable and I know I will use it a ton. I just watched this Food Network show down with Bobby Flay and this cupcake lady. Wouldn't it be fun to own a cupcake shop? I have ALWAYS wanted to run a little bakery business from my home. I could put cupcake tags with this stamp on all my cupcakes! Ahhhhh, to dream. The recipe for this card includes Memory Box card base and card stock, Cosmo Cricket Sugar patterned paper, Spellbinder's scallop rectangle and a delightful sprinkling of 2 pink Dew Drops from Ellen's store. I also used the Vine Ribbon Millinery Lockhart stamp on the bottom of the card, Copic markers to color in the image and SU! Groovy Guava ribbon. Notice how I cut the main image with the scallop rectangle die this time. Usually I cut the image out plain then mount it on a scallop mat. I love how the bright white is enhanced with the scallop cut and embossing. This card cracks me up! I always say *Well, that just stinks* so I just had to create this sentiment on my computer and print it off. These socks are from another new Lockhart image called Warm Socks. I turned them into stinky socks for this card though. 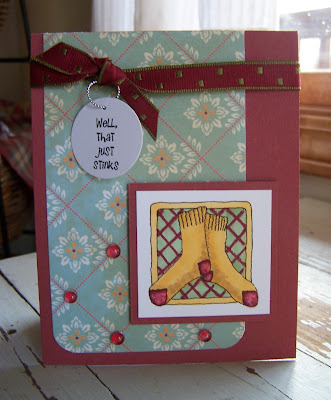 But I made this stinky sock card as elegant as I could by adding the pretty ribbon, Cosmo Cricket paper and more of the fun Dew Drops. I colored the image with Copic markers and achieved the dirty sock look by just dabbing the finished colored image with shades of tan markers. I can't wait to maker more of this card......it seems that the *down to earth, tell it like it is* kind of cards are always a hit! 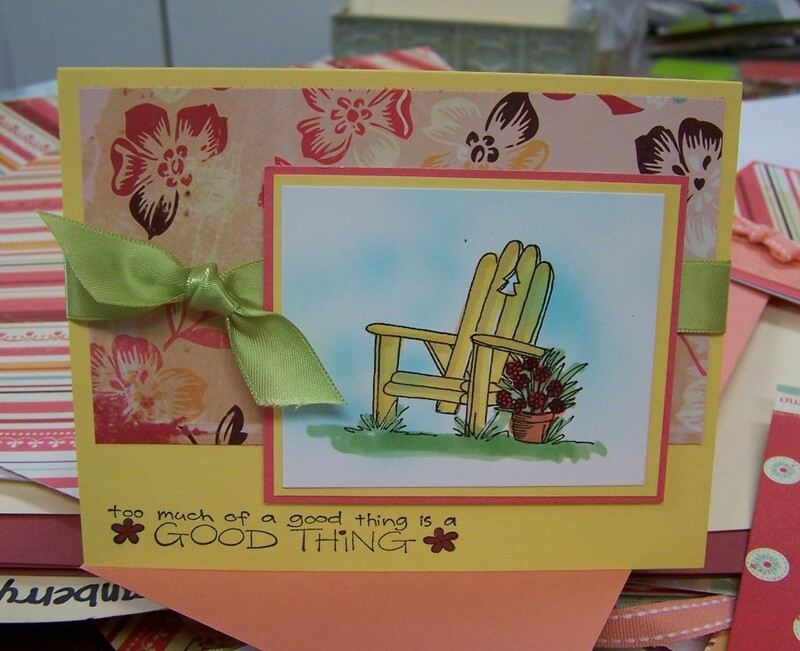 Here's my final card I made using Karen's new Adirondack Chair image. I colored it with Copic markers then airbrushed in a cloudy sky with the Copic Air Brush System, available at Ellen's store. 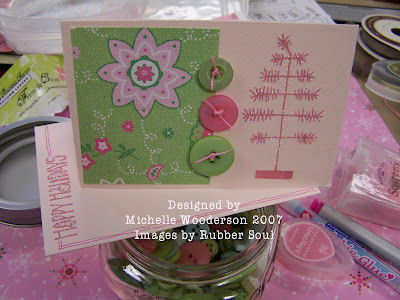 Base card is from Memory Box, patterned paper is from Cosmo Cricket Sugar line. Sentiment is from Stampin' Up!. I can't wait for summer to roll around so I can use this image tons! Okay, so what do you think? Do you think you'll try to make some inchies? I'd love to hear your ideas about what you can do with inchies. TIP OF THE DAY: COME BACK LATER THIS AFTERNOON AND I'LL HAVE ANOTHER NEW LOCKHART STAMP PREVIEW. I'M HAVING SO MUCH FUN I JUST CAN'T STOP!!!! Q & A: On yesterday's cards, I used some green canvas across the front of my cards. It does not wrap around the card. I neatly snip the edges off at the sides of the card and then use a little liquid glue to seal the edges so they won't fray. Update on the family: My mom is doing wonderful, although she backed her pickup into my dad's tractor which had a fork loader on the front of it. She now has this nice hole through the tail gate! Josey has chicken pox and Jordan was up all night throwing up! Niiiiiiiice! Have you seen the little pink pencil Christmas trees this year? I have noticed them everywhere and think they are SO dang cute! I wish I had a room in my house to totally decorate in pink Christmas items.....but I don't so I'll stick to making some cards! All of these images are from Rubber Soul. They have tons of cute Christmas trees and Christmas themed stamp images. This card uses a pink (yes it's pink but doesn't show up well in the photo)Auturo card and envelope available at Ellen's store. They make card making so easy! I found some Christmas patterned paper scraps from last year and added some big pink buttons and glitter and I was done! This little stick tree reminds me so much of those cute pink trees. Here's a close up of the buttons and glitter! Pine will be so proud that I threaded those buttons! Oh and check out the envelope, I used a Copic multiliner in pink to add some sketchy lines. Here's another one that has a green theme. More of those big buttons from Foofala and hand drawn lines on the envy. This one's made from some paper scraps I had left over and more cute Rubber Soul images. This is a fun one. The card and the envelope represent going on the hunt for the perfect Christmas tree. The card shows the Christmas tree farm and the envy shows the perfect tree all loaded up and ready to take home. 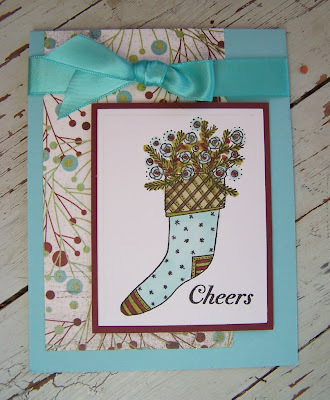 The paper strip on the top of the card is from Cosmo Cricket, love those pine cones! Stamp images from Rubber Soul. Here's a close up of the envy. I love making little ensembles out of stamps. The tree and car are one image, the star and sentiment are two more separate images and the line for the road is hand drawn with a Copic multi liner. 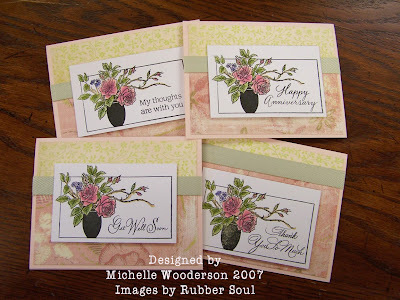 Edited: Here's another link to the Rose Border stamp set. Click HERE. These cards are made from one Rubber Soul set called Rose Border. (When I click on this link, it comes up with an *X* so I hope it shows up for you). It's a more formal set with beautiful sentiments. What I really love about this set is that the main image is the vase and the rectangle border. The sentiments come as separate stamps so you can add what verse you want depending on the card's occasion. For Christmas gifts for the ladies of my family, I go through my stash and package up 10-20 cards for various occasions. I know some of these will make it into those packages. I might make up some more and do these as sets with a different sentiment on each card. Base card is SU! Blush Blossom. Copic markers for coloring the image. Patterned paper by My Mind's Eye. Green canvas twill from Martha Stewart at Michael's. Good Morning Fellow Stampers!! Are you all dragging this Monday morning? My poor Josey has Chicken Pox!!! So she'll be hanging at home with Mom this week! Jordan was not a happy camper getting up so early this morning for school either. I'm infusing myself with coffee as my friend Val says. Hope you all have a great week! Here's our winner of the Hanna Stamps sentiment set! Congratulations Lori!! I'll contact you at your blog to get your mailing address!! Thank you to all who entered the drawing, I had 284 wonderful comments!!! After dinner at my mom's house, it's time to clean up and snack on the turkey skin and left over desserts. Have a happy holiday! 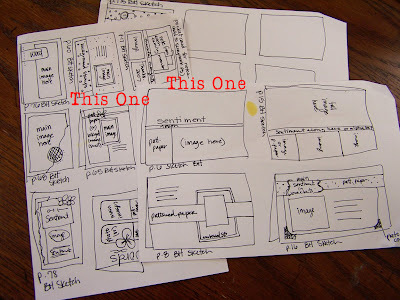 When I have free time I like to sketch out card layouts....very similar to what Becky Higgins does for scrapbook page layouts. I keep them in my card idea notebook that I've posted before. And I know Becky loves to make cards too and has begun to incorporate card ideas from her scrapbook layouts in her monthly spread in Creating Keepsakes magazine. So today's cards are are totally inspired by a few of Becky's scrapbook layouts from her new Sketches book. 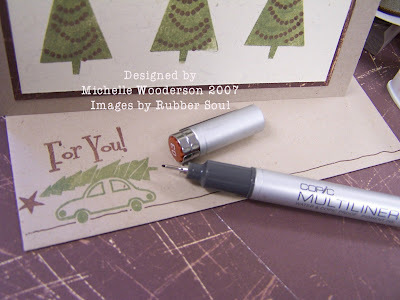 It is an invaluable resource for me as a scrapbooker AND a stamper. The idea is to find snippets of Becky's scrapbook layouts that would be suitable for cards. So I'm just using a portion of her layouts and interpreting them into cards. 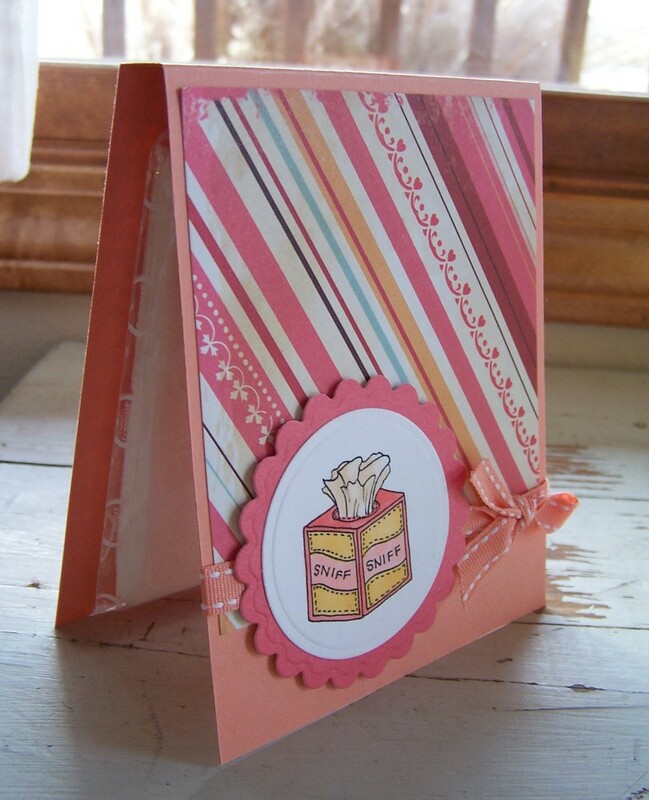 It's the perfect inspiration to find fun new twists for card layouts. You can find Becky's new Sketch book HERE or at your local scrapbook stores and you can follow Becky's blog HERE. If you missed her 12 Days of Christmas videos, be sure to scroll down to find them. She offers some great tips, and I think she had a different hair style every day......wish I could do that with my hair!! Here are some of the sketches that I came up with after browsing through Becky's Sketch book. I usually sketch on scratch paper. Then if I like the layout after finishing a card and think it will be a *keeper* card layout that I'll use again and again, I'll add it to my card idea journal. This card uses the new Basic Grey Figgy Pudding patterned paper, Karen Lockhart's Star Angel image and a PaperTrey Ink sentiment. This layout is a great way to incorporate two patterned papers easily, without being too *cluttered*. It's inspired from Becky's sketch on page 6 of her book. Image is colored in with Copic markers. I added silver shimmer to the angel's wings with a Silver Copic glitter pen and sparkle to the stars with Stampin Up! Dazzling Diamond's glitter. LOVE this layout! The next card was inspired from Becky's sketch on page 65 of her book. Very clean and simple design and again allows a big piece of patterned paper to show through on the background. The image is from Karen Lockhart and is called Christmas Rose Stocking. I love the non-traditional colors on my cards today. I got the color inspiration from the fun Basic Grey Figgy Pudding patterned paper. I think this pretty robin's egg blue color and brown are my favorite color combination right now. I just can't get enough of it!! The image is colored with Copic markers. Simple *Cheers* sentiment from PaperTrey Ink. 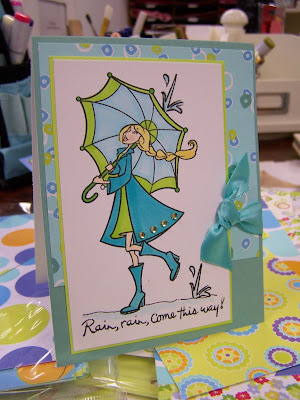 Tip of the day: Next time you're waiting at the doctor's office or are sitting at your kids' practice, take along a little sketch book and your favorite marker and sketch out some card designs. It's fun to go home and create a card with a sketch you've drawn......then to see if it turned out like you planned. The hardest thing to do when creating cards is to get out all of our supplies and then to stare at that blank piece of cardstock with no ideas. By having a journal full of sketches, the inspiration will come quick and easy. Then it's just a matter of putting together the design elements like color, patterned paper, embellishments and ribbon. Try it, you can do it!! Hope you all had a wonderful Thanksgiving! My mom is feeling much better so we're having a small dinner at her house tonight.....I knew she wouldn't stay down long, she's a worker bee and needs to be flitting around some. My little one is at her house now helping Grandma. DH and my oldest are delivering a load of firewood. I'm stamping while everyone is gone!!! Be sure to check out the previous post to sign up for a FREE Hanna sentiment stamp.....over 25 sentiments that will match Hanna stamps! I will pick a name on Sunday or Monday. 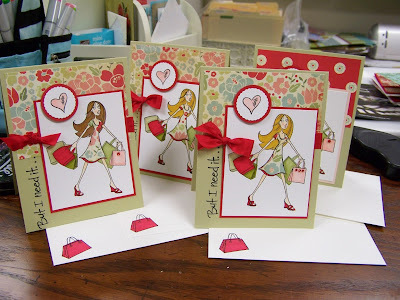 After having my girly girl Card Club last weekend, I was in total girly mode when creating these cards. 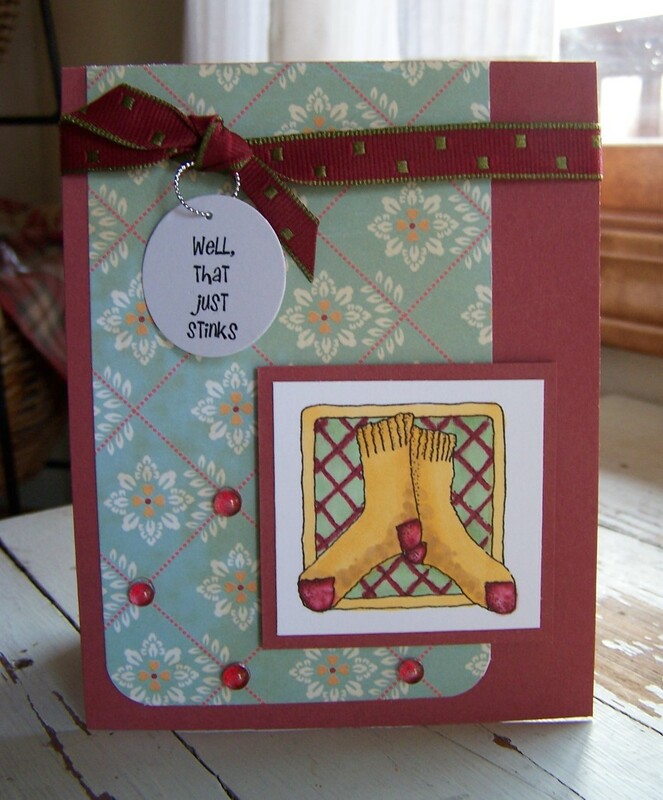 This first one uses Karen Lockhart's adorable Child's Stocking stamp. I love all the toys and candy sticking out of the stocking and the little blanket stitched round accents too. I drew the color inspiration from the SU! polka dot patterned paper and used Copic markers for coloring. It's hard to see but the stocking is all glittery from a Copic glitter pen. I die cut and embossed the main image with a Spellbinder's rectangle die template and then mounted that onto a scallop cut and embossed SU! Certainly Celery piece of cardstock. Card base and SU! tab punch are in Pixie Pink. For You sentiment is from SU! also. The two white brads are from StarLit Studio. Cindy's brads are THE BEST, I love them......need more, making note to self! I love this card and will save it for a perfect little angel for Christmas. This card is so fun! 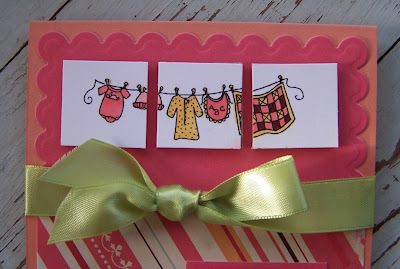 Pocket cards are a favorite design of mine so it's also easy to come up with some fun creations. 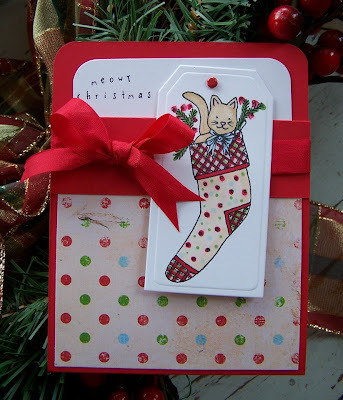 I used Karen Lockhart's Kitty In My Stocking stamp and colored the stocking to match my patterned paper by adding in a few extra polka dots with my Copic markers. 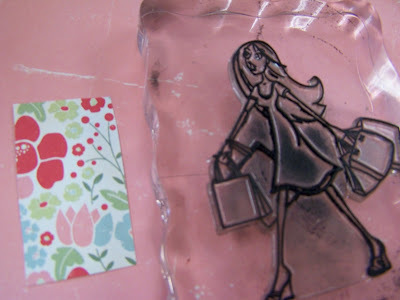 The main image was cut with a Spellbinder's Tag Die Template which I LOVE, I use it a ton! I attached the tag to the pocket card insert with a brad. When the white card insert is slipped into the pocket, I simply slipped the tag onto the outside of the card. So when you pull out the white card, the tag comes out too. It's a great way to show off a fun image! The *meowy christmas* is stamped from Karen Foster's discontinued snap stamps. Ribbon is by Martha Stewart, available at Michael's. The pocket card is stapled together with two staples, one on each side of the pocket under the ribbon. I couldn't resist getting my pets to pose with this card. On the left is Emma. I tried to get her to pose by herself with the card but she wanted to be pet so badly that she just kept nuzzling the card....I think she likes it! On the right is Hammy, our new man of the house since our beloved Tiger disappeared recently. Not house cats actually but they would like to be. That's Josey with her *metal mouth* in the middle. I'm secretly trying to find a calico kitty for us as a Christmas surprise. Living near a timber, our cats disappear often from wild coyotes we suspect. Calicos are my favorite and I've spied about a dozen at this farm. 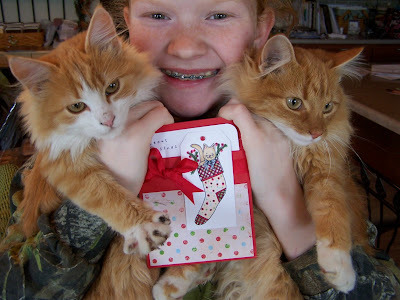 I'm hoping the owners will love to give my girls a new kitty for Christmas. DH will not be thrilled but he likes whatever makes us happy! Anyone getting a new pet for Christmas? First of all I'd like to thank you all for keeping my mom and I in your thoughts and prayers. My mom had to have a stint put in a 90% blocked artery! She will be home later today and needs lots of rest and TLC! Secondly, let's talk weather.........it's FREEZING here in Kansas! I am definitely not a cold weather fan so I'm a little grumpy about it! 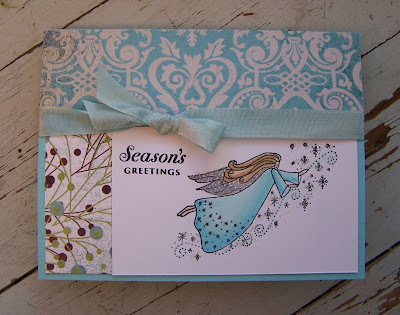 But the cold weather season does enable us to create fun wintry cards though right? Today's card features Hanna from the set Tis the Season. I used Copic markers to color the images then airbrushed the stars for a pretty blue blow. The starts are twinkling with Stickles. I wanted more of my patterned paper to show through so I cut a semi-circle out of the main image with a plain Spellbinder's Circle Die Template. 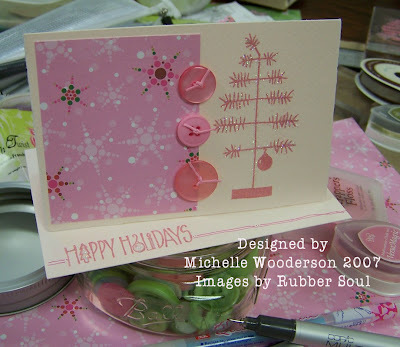 Then I added a Spellbinder's cut circle and stamped and airbrushed the big snowflake. This is adhered to the card front with SU! dimensionals slightly off center. Hanna's skirt is also paper pierced from the same Basic Grey Figgy Pudding patterned paper. The strings for the stars are hand drawn. So who would like a FREE Hanna stamp set? The two sentiments below are from a brand new all sentiment set called Things Hanna Would Say. You could be a lucky winner of this not yet released stamp set. 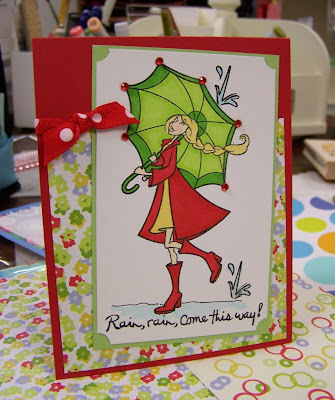 Check out Kristi's blog HERE for more details and be sure to visit the other Hanna Stamps Designer Team blogs.......we're all giving away a FREE stamp set!! To enter for the drawing, which will be held on Sunday, please reply to this post with an answer to the following question: What do you do AFTER Thanksgiving dinner? Do you nap? Play games? Go for a hay rack ride? Head off to another dinner that you're too full to even think about? I know for us, we'll not be having a Thanksgiving dinner on my family's side. My mom needs her rest and having her home and recovering is what I'm really thankful for this year. Have a great holiday, eat some turkey for me and be safe travelling! Rubber Soul Christmas...and our winner! Sorry for not being around much lately. My mom is going in first thing today for heart surgery and it's really all I've had on my mind lately. Please keep her in your thoughts and prayers. We do have a winner of the adorable Rubber Soul set.......drum roll please......our winner is Shelli Worgess who suggests a family vacation to beautiful North Carolina!! Woohoo Shelli!! Please email me at stamplady@satelephone.com with your mailing address and I'll get your stamp set sent out to you! Thanks for all the wonderful comments on places to visit. We sure have a lot of Virginia fans that's for sure! I have a ton of places in the good ol' USA that I want to visit now!! Now on to today's creations. This first card has a whimsical take on the holidays. 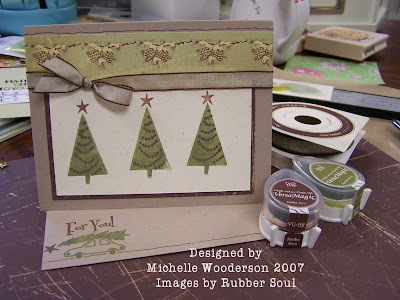 I used Rubber Soul's wood stamp set called Christmas Stick Love and the sentiment is from the clear set called Vacation. These stick people images are super easy and super speedy to color in. I simply used the pointy end of Copic Sketch markers. 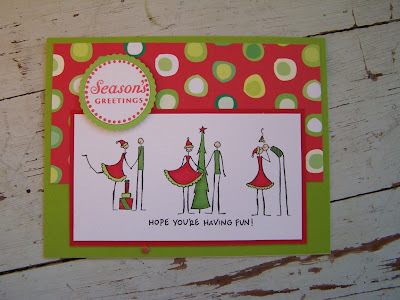 The round Season Greetings sentiment is from PaperTrey Ink along with with the circle frame. 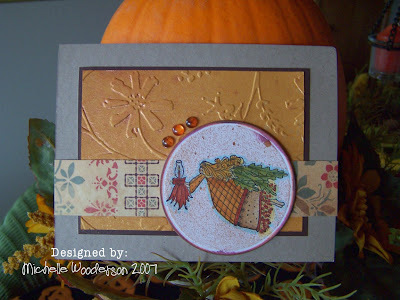 A Spellbinder's small circle Die Template was used to mat the sentiment. 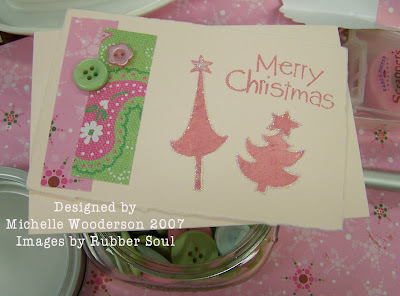 Background paper is from the Winter Soulstice 8 x 8 paper collection from Rubber Soul. Card base is from Memory Box, available at Ellen's online store. This card features another cute stick person from the clear set called Vacation. This sassy little girl is flaunting her winter wear and cute little boots. Very simple image but oh so cute! I paired her with a Rubber Soul/Wordsworth sentiment, love the script on this one. I colored the girl in with Copic markers and used a sticky scallop page pebble from AMuse to highlight the main image. The bracket is a fun die from Spellbinder's Brackets Die Template set. Have you noticed that brackets are everywhere these days? Card base is Memory Box from Ellen's online store. 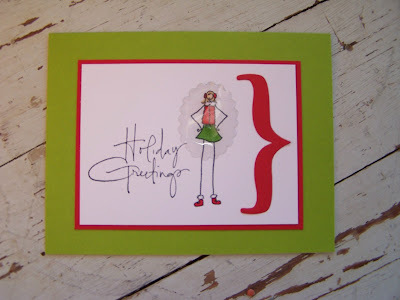 Tip of the day: Remember that all of your holiday themed cards don't have to be just Christmas cards that you mail out. You can send holiday cards out for birthdays, thank you cards, etc. I like to keep a little stash handy that are generic enough in nature to use as just note cards. That way if you run short on a Christmas card, you can grab one from your stash....or if you need a birthday or thank you, you'll be right in tune with the holiday season! So happy stamping? Are you guys making your Christmas cards this year? I usually do just one design and mass produce but I think I've got a good head start with all my blogging cards this year. Woohoo!! I'm enjoying my fall themed cards right now because I know once Thanksgiving is over, the Christmas season will be upon us in full force. I like to have cards like this on hand that have no sentiment on the front. That way I can add what I want to the inside of the card or simply leave it blank and add my own message. This image is called Harvest Angel and is by Karen Lockhart. Karen has a series of angels that fit most of the seasons and the details are wonderful. I colored the image with Copic markers then airbrushed it with a brown Copic marker. For the background I used a Cuttlebug folder on SU! More Mustard card stock along with some coppery colors of Glimmer Mist. The Glimmer Mist kind of settled into some of the embossed areas, creating lots of depth. 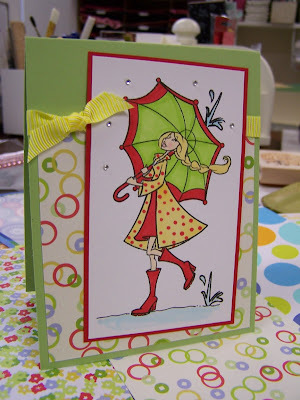 I finished the card off with a strip of Cosmo Cricket Gretel patterned paper and three Dew Drops. Tip of the day: This is one of my favorite, reliable layouts I go back to often. The main design elements of the card are the circle accent piece and the strip of patterned paper behind it. 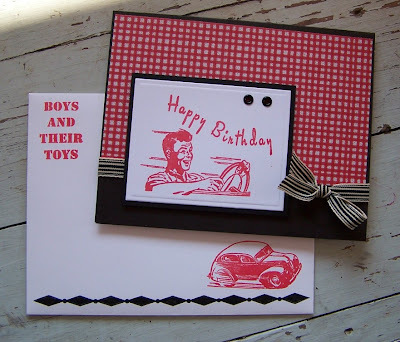 This enables you to use patterned paper without it taking over the main design of the card. You can even leave off the textured background piece to keep the design simple. To make the card look more like a piece of stationery, you can also reduce the size of the circle.....maybe using a monogram type stamp or a word image. Last weekend we took a three day vacation to Branson with my family, my inlaws and my husband's grandmother. We had a great time, I hadn't been to Branson since I was a little kid. My FIL signed up for one of those time share seminars so we got our room and one nightly show for free, woohoo! So this card is for my in laws as a thank you card. The stamps are from Rubber Soul/Wordsworth. The stick girl and the vacation sentiment are from a clear set called Vacation. The other stamp is a wood image which features the blowing leaves. The scenery in Branson was beautiful. The leaves were all turning color and I have never seen so many oak trees in my life. Totally gorgeous drive! The rest of the card features Scenic Route (appropriate right?) 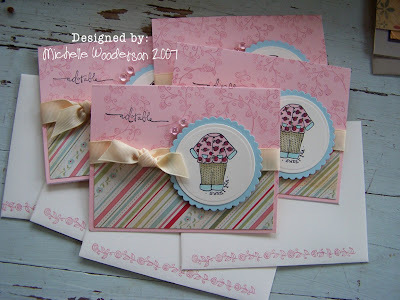 patterned paper and some of those yummilicious Dew Drops from Ellen's online store. I colored the image with Copic markers and then airbrushed some mustard yellow onto the image. 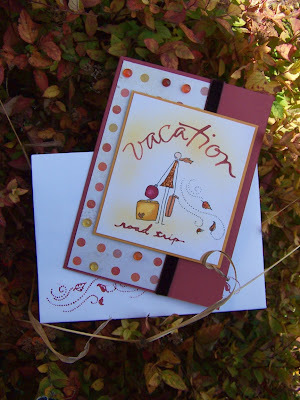 The vacation sentiment is multi colors of fall and was created by applying 3-4 colors of ink onto the stamp before I stamped the image off. Love the Versamagic Chalk Inks for this technique. The dress is finished off with some Copper Stickles. 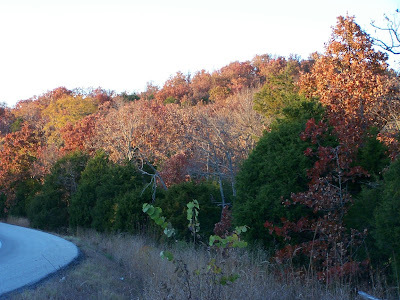 (Copics and Airbrush System available at Ellen's online store) Here's some of the beautiful trees that are changing color in Branson. Another photo overlooking Branson. My girls sure wished that Ferris wheel was working that day! Okay, I have two stamp sets to give away this month from Rubber Soul. The set is called VACATION and features some cute, cute stick people. I love the dude with the camera and the sentiment *like you blend*....totally cracks me up!! I will be giving away one set to one lucky person who comments on today's post. I'll save the other set for another day so check back soon. So here's the question you must respond to: Where would you suggest I go for the best mini vacation? Tell me somewhere I can take my family for an extended weekend and why I should go there. I love the beautiful scenery the best but the city life can also be fun! I will pick one winner by the weekend......be sure to leave your name so that I can mention you as the winner. I'll then have you contact me via email with your mailing address. Good luck, I can't wait to read your comments. 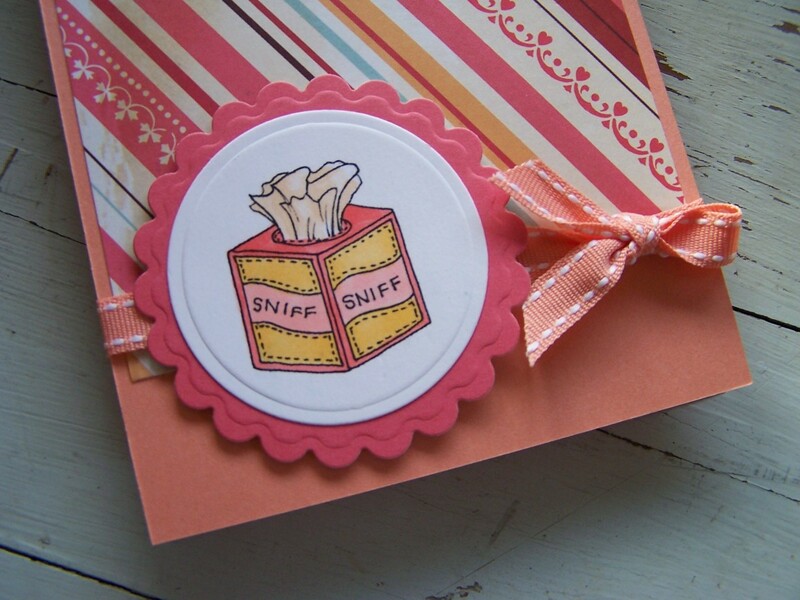 Are you ready for a fun new set from Hanna Stamps? It's called Rainy Day and will be available Friday, November 16th (Thursday at midnight if you're a night owl). You can get your set at Hanna Stamps right HERE! 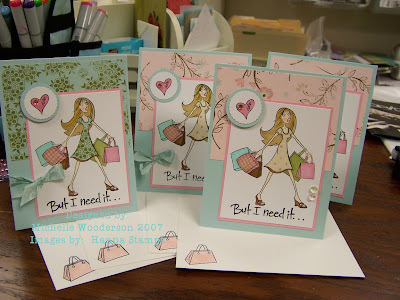 The Hanna stamps are so darling and they take front and center stage on your cards. 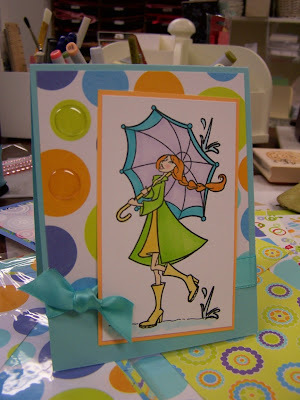 These cards will be perfect to make during the winter months, when I'm dreaming about Spring! All of the papers are from Rubber Soul, I just love the fun and fresh patterns. The two packs I used on these cards are called Hoop-la and Shake It Up. And of course, I colored all my images with Copic markers. You can get a great starter set from Ellen's online store. 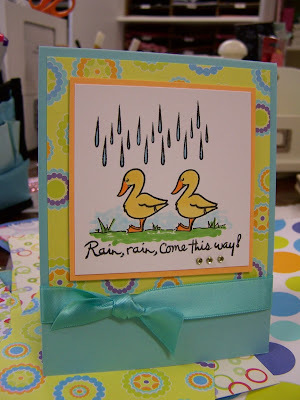 This card has two page pebbles adhered over the big polka dots to resemble giant rain drops. Below I used red sequins to accent the umbrella. Clear sequins pose as glistening rain drops on the card below. The paper's fun circle design reminds me of water rings in a water puddle and the polka dots on Hanna's raincoat were made with the sketch tip of a red Copic marker. Hanna gets fancy on the card below...she's sporting 5 green sequins on her rain coat. And finally, the double duckies don't mind the rain at all. I drew the grass line with a fine tip marker. Hi everyone! 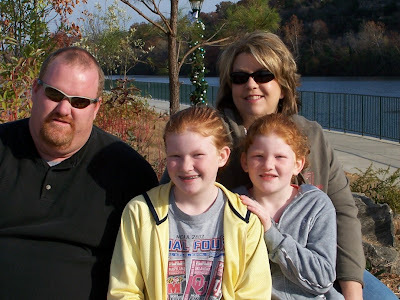 My family and I just returned from a short vacation to Branson. We had a great time and the scenery was breath taking. The fall trees were bursting with color and the girls got brand new Build-A-Bear critters...so all is well. Please take a moment this Veteran's Day to remember all of those who have served for us. Enjoy your freedom and the beautiful country that we live in!! On to the cards. These are some more baby cards that I made up for my stash basket. 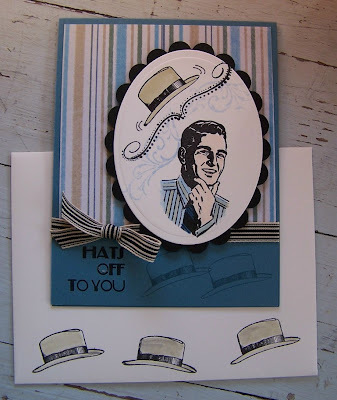 This first little cutie uses the Lockhart images Sweet Pea along with some background stamps from the millinery collection for the card base and the envelope. The main image is colored with Copic markers to match the Cosmo Cricket baby patterned paper. I love the hint of vintage that this card has. Image was cut and embossed with a circle Spellbinder's Die Template and then mounted on a scallop cut blue circle. 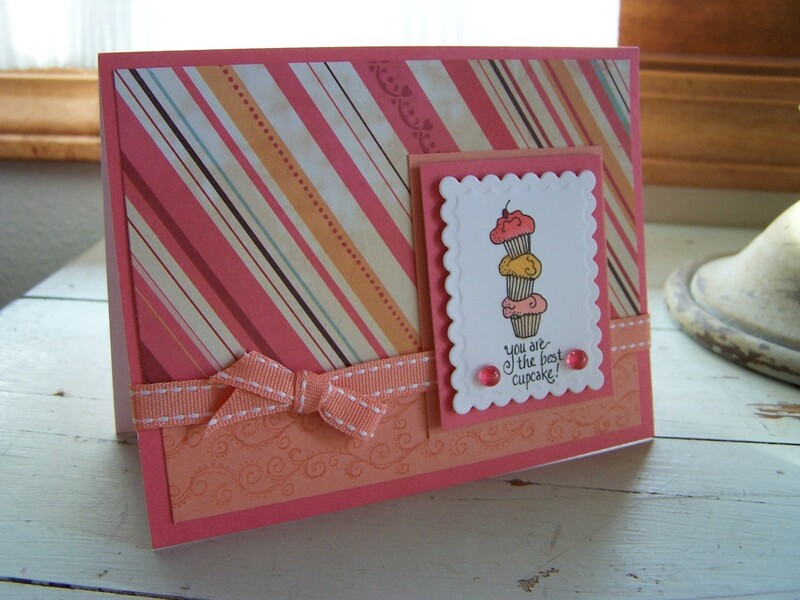 Two cute pink Dew Drops add a little accent to the card along with some cream SU! grosgrain ribbon and the SU! *adorable* sentiment. The boy baby cards feature the Lockhart image called Snip & Snails. 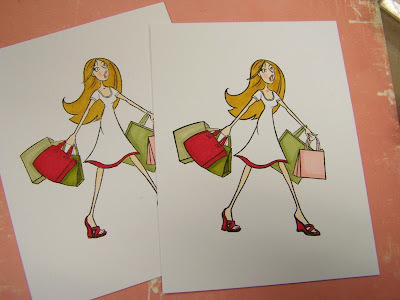 Again, I colored my images with Copic markers to match the patterned paper. 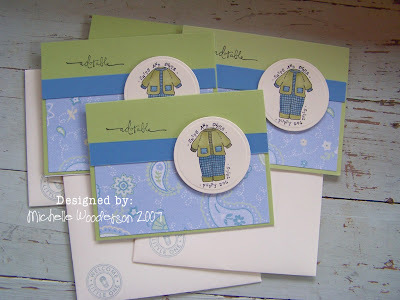 I cut and embossed the images with a Spellbinder's circle die template but left off the scallop mat this time. SU! *adorable* sentiment and stamp was used for the envelopes. Tip of the day: Whenever I use patterned paper, I usually finish off the top edge of the paper with some kind of horizontal element. 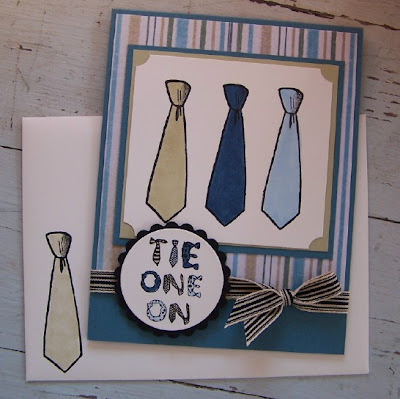 For the girl cards, I used ribbon and for the boy cards, I used a strip of blue cardstock. I think this finishes off the *edge* of the patterned paper and creates a nice transition from the patterned paper to the solid cardstock base. There seems to be a lot of babies around my neck of the woods. Lots of girl babies which is sooo much fun. So you might be seeing more baby girl projects this month. 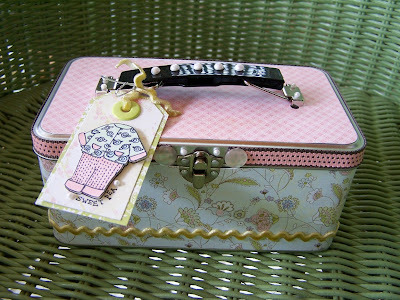 This is a Maya Road tin that I altered with Basic Grey Lily Kate paper, buttons and ribbons. The handle has white decorative pearls. The tag is made with a Lockhart stamp called Sweet Pea. It's the most darling little stamp that can be used for baby girl projects or even into the toddler years as a little girl outfit. I stamped the image in black on the base tag then stamped the image again and colored it with Copic markers. I then cut the colored image out and adhered it to the tag with SU! dimensionals. 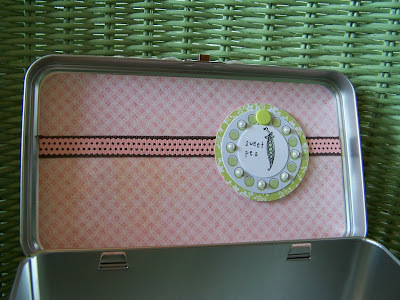 A little white decorative pearl accents the *sweet pea* sentiment. This is a view of the inside of the lid. I adhered patterned paper and ribbon to the inside of the lid and then added a circle accent piece that has the Lockhart Itty Bitty Peas stamp colored wit Copic markers. The little circles on the patterned paper are accented with more white decorative pearls. *Sweet pea* is stamped with retired Karen Foster mini alphabet letters. 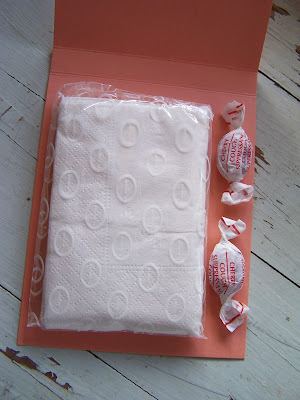 I think would make an adorable little gift filled with baby items like cotton balls, qtips, lotions, etc. Or it would also make a nice little memory box that could be filled with baby's first onesie, booties, hospital bracelets, hair ribbons, etc. Oh, and the nice thing about the lid is that the handle can be removed for easy placement of the patterned paper for the top of the lid. Paper Piecing Clothes for Hanna! Step 1: Stamp your full image onto white card stock. Color in all of the parts that will not be paper pieced. For these samples, the dress will be left white because that's what I'm going to paper piece out of patterned paper. Set aside. Step 2: Cut scraps of patterned paper just big enough to fit the dress on. No need to stamp the entire image because you'll just waste more of the pretty paper. 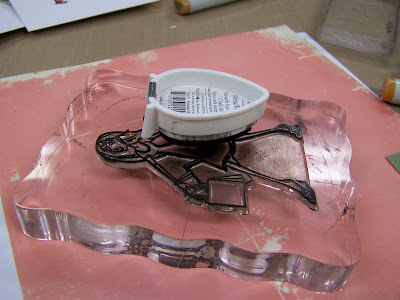 Step 3: Place the acrylic image onto a large block and turn image side up. Ink the stamp, just concentrating on the dress since that's all that is needed. Step 4: Place the piece of scrap card stock patterned side down onto the stamped image. Make sure that the paper fits fully over the dress. 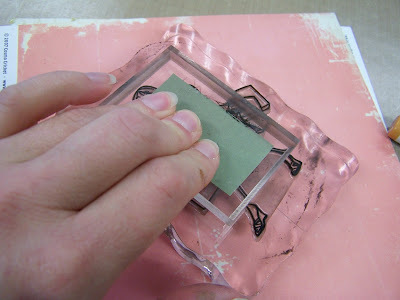 Step 5: Place another clear block over the piece of scrap paper, making a *sandwich* of sorts. The scrap paper will be in between the two clear blocks. Press down the top block firmly, but do not rock.........you can put on some AC/DC and rock out.......just do not rock your clear block. Step 6: Remove the paper scrap from the *sandwich* and you should have a stamped portion of the dress. 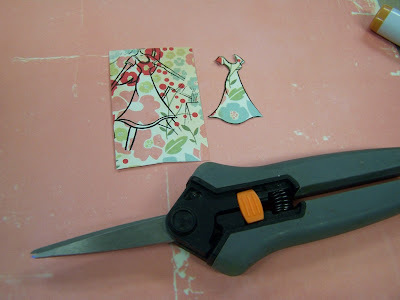 Cut out the dress with fine tip scissors. A nice pair of fine tipped scissors is key here so that you can get into those tiny little spaces. When I cut out the dress, I like to cut just on the outside of the black, stamped line. This adds a lot of definition to the image and makes the dress really stand out. Step 7: Adhere the paper pieced dresses to the main colored images. I like to use Hermafix Removable Dotto adhesive because you can remove any leftover adhesive once the dress is in place. 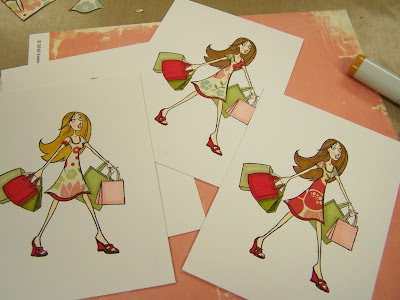 Step 8: Create the cutest cards EVER with your new images! These cards have fun accents of red A Muse Creative Candy available at Ellen's store, a scallop circle from a Martha Stewart punch and some red binding ribbon from Martha Stewart. Base card is Stampin' Up! River Rock. Images are colored with Copic Markers. Look at these little darlings! This is my new favorite paper from Making Memories called Note Worthy, found at Archivers. Accents are pink sequins and a pink and green Dew Drop from Ellen's store. Ribbon is from Martha Stewart. Base card stock is Stampin' Up! Soft Sky. Images were colored with Copic Markers. New Crafty Secrets Set Preview!! 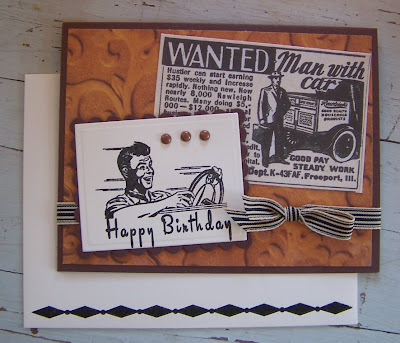 These cards show the preview of a brand new set from Crafty Secrets called Favorite Fellas. 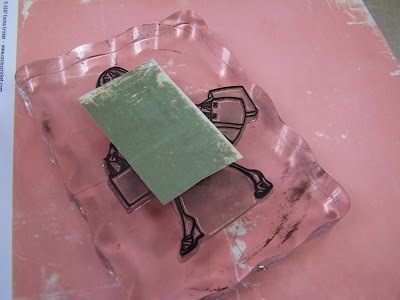 Here's a LINK to the stamp set at the Crafty Secrets website. If you've been looking for a good guy stamp set like me, this is a good one to add to your collection. Check out all the images it has to offer....22 images and sentiments!! And I just love how you can dress up the envelopes too to match the card. So fun!! Also, Crafty Secrets now has it's own forum over at Splitcoast Stampers. There will now be a gallery of cards made by CS designers and you can chit chat too. Be sure to check out the new forum at THIS LINK. If you are unable to get the link to work, you may need to register as a member of Splitcoast Stampers. It's free and such a valuable resource for card ideas and just a fun place to meet new friends. Scrapbooking Weekend Here I Come!! !